You know what that means. That means that some kid somewhere is all pooped out. That means that said kid is dehydrated and in need of a delicious beverage to feel better. Enter: The Kool-Aid Man. And of course, if you want to do it right, the Kool-Aid man must burst through walls and furniture, wrecking things in his path in order to reach the dehydrated children with his sugary goodness. He must call out his catch-phrase while doing so in order to announce his presence so the thirsty children may rejoice! Oh, yeah. So be honest with us. You want to burst through things too, don't you? You want to skateboard/swing/drop in just when you are needed bellowing out an iconic catchphrase to make everyone smile and laugh? Well then, we have just the thing for you. 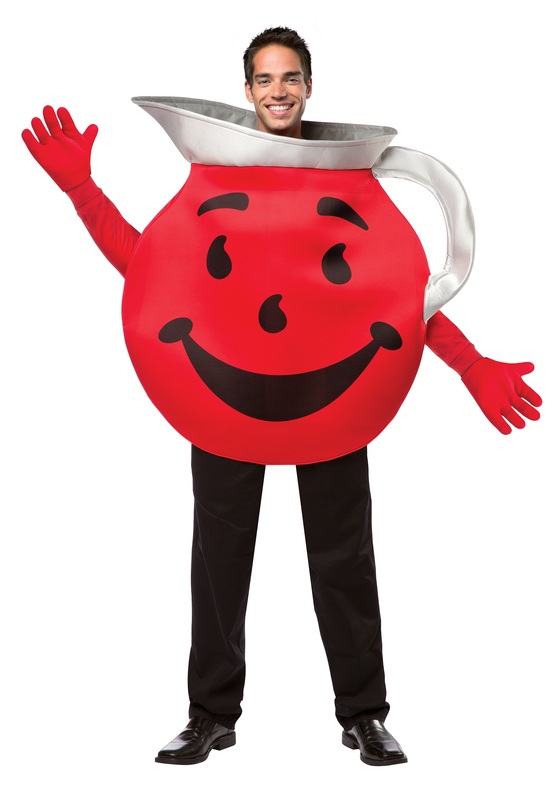 Our Adult Kool-Aid Costume will transform you into the Kool-Aid man himself. This foam-bodied costume has the shape of your favorite super pitcher, in his bright red color, with his big smile, and eyes on the front. It comes with full-arm red gloves, and a silver handle and pour spout. You'll look like the most epic of thirst-quenchers in this outfit. You'll be the super cool Kool-Aid man himself! Now, go forth and bust a move for thirsty friends everywhere!